The nineteen year career of D5047/24047 included allocations to Eastern & London Midland Region depots. Built: BR Crewe Locomotive Works. Carried green livery with TOPS numbering (2/74 - 4/75). Time between last Classified repair and withdrawal: 42 months. June 1965 to Tinsley (41A). November 2nd 1977 to store. November 3rd 1977 reinstated to Crewe. 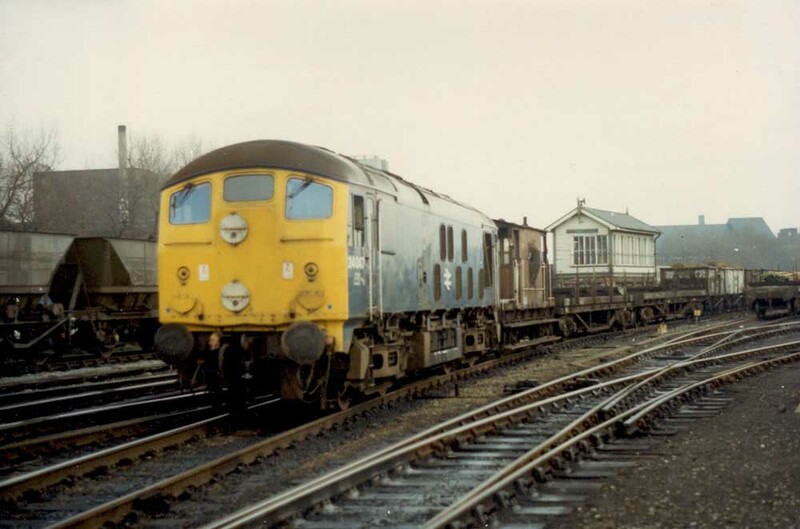 After withdrawal 24047 was stored at Crewe depot until December 13th 1978 when it was moved to Doncaster Works and scrapped there during February 1979. Noted Stratford Works August 1962. Noted Doncaster Works October & November 1963. Noted Doncaster Works March 1964. Noted Derby Works April 1975 (repaint into blue livery). Photograph collection of webmaster. 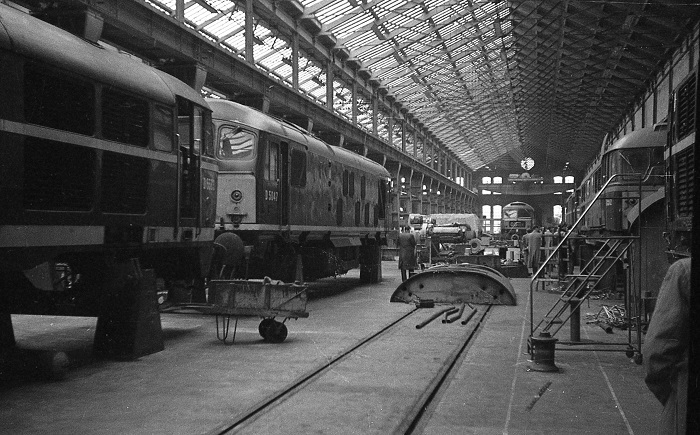 D5047 under repair at Doncaster Works, possibly during 1963 or 1964. Condition date uncertain c1967 or earlier: green livery with small yellow warning panels, curved upper corners, gap between bottom of warning panel and frame level stripe, full size fuel & water tanks, blanking plates fitted, hand/footholds present, ridge sided sandboxes, three-rung bogie footsteps, engine exhaust in original position, steam style shedplate on cabfront. Condition date uncertain c1969: green livery with small yellow warning panels, squared upper corners, bottom of warning panel does not completely cover frame level stripe, full size fuel & water tanks, blanking plates fitted, hand/footholds present, ridge sided sandboxes, three-rung bogie footsteps, engine exhaust located above engine room. Photograph collection of webmaster. 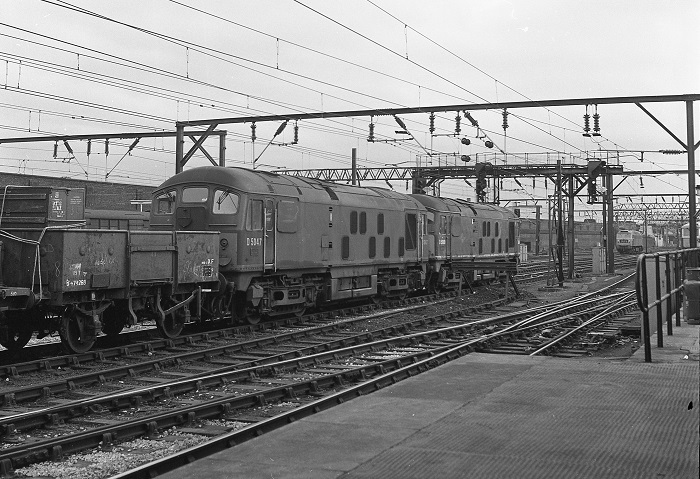 D5047 & D5089 head south through Crewe station, date unknown. Special duty for 5047 occurred on the afternoon of June 11th when it towed newly completed 41001 from Crewe Works to the Research Center, Derby. Condition February: green livery with full yellow cabfronts, gangway doors present, full size fuel & water tanks, blanking plates fitted, hand/footholds plated over, ridge sided sandboxes, three-rung bogie mounted footsteps, blue TOPS data panel underneath number, builders plate on cab door. On June 7th 24047 came to the rescue of an ailing Llandudno – Blaenaeu Ffestiniog diesel multiple unit which had failed near Llanrwst with insufficient power to climb the steep gradients. On February 21st 24047 & 24084 were noted on a cement train at Birmingham Curzon Street. During April 24047 visited Derby Works for a scheduled repair, this included a repaint from green to blue livery. On January 11th 24047 arrived at Tyne Yard with a freight from Healey Mills, the Class 24 later working south with a car train for Morris Cowley. On June 3rd the 17.20 Llandudno – Manchester used 24047 as a replacement for 47205 which had arrived from Manchester but sustained collision damage at Llandudno(?). The iron ore trains in the Shotwick/Bidston Dock area were now in the hands of Class 25s following the general demise of the Crewe based Class 24s. However 24047 & 24080 were frequent performers on these trains during early September. Whilst working the 13.27 Crewe - Derby service on February 13th 50741/59272/50686 became a failure, being noted an hour late through Longport behind 24047. On February 16th 24036 & 24047 worked a late evening Crewe - Shotwick freight. On February 18th/19th 24063 & 24047 worked a late evening Crewe - Shotwick and Shotwick - Pratts Sidings freights. 24035 & 24047 worked an early morning Grange Junction - Shotwick freight on February 26th. 25161 & 24047 were noted with empty sand hoppers between Leek Brook & Oakamoor during the morning of April 12th, later they returned to Stoke with loaded hoppers. 24047 & 24023 stabled at Cockshute on May 7th 1977. 24047 was noted at Llandudno Junction on December 1st. On February 14th 24047 & 24035 were noted at Crewe station after depositing a rake of coaching stock in the carriage sidings alongside the Manchester line. 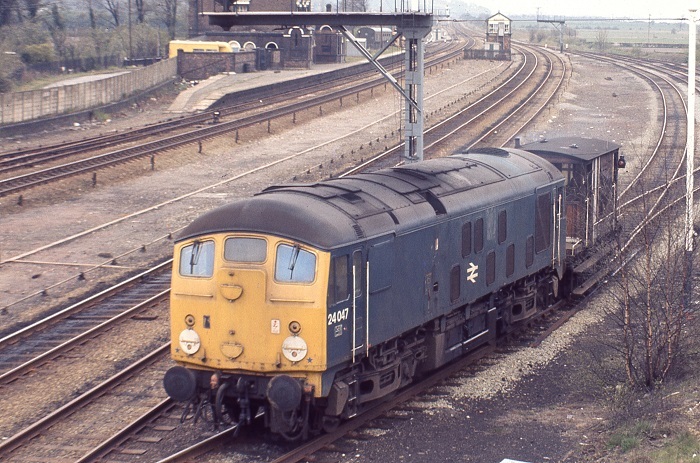 On February 26th the 00.35 Healey Mills - Warrington Arpley freight was worked by 24047. More passenger duty befell 24047 on April 29th when the 16.00 Crewe - Cardiff failed at Donington behind 25058 (or 25055?? ), the Class 24 taking the train as far as Hereford where 47358 took the train forward. 24047 & 25153 worked the 04.50 Grange Junction (BSC Skelton Works) - Shotwick freight on June 2nd, comprised of mineral wagons. On June 17th 24047 and fourteen empty vans worked the 5H09 Bangor - Manchester Mayfield. 24047 & 25220 were noted at Cockshute on June 19th. 24047 and a breakdown train were noted at Barmouth on July 2nd (date assumed from less than precise photo caption details). The addition summer services and holiday extras provided plenty of unusual diesel haulage on the North Wales line, but the star turn was still the diagram commencing with the 09.42 Llandudno - Manchester. June 28th - 30th & July 3rd & 4th saw 24082 on this diagram, July 6th & 7th had 24023. On July 10th 24047 got as far as Chester on 16.42 to Crewe, being replaced by 40145. July 11th & 12th saw 24023 again except it was replaced on the 20.30 Crewe - Bangor by 24063, getting only got as far as Chester before 24035 took over, which succumbed at Llandudno Junction! On July 19th 24047 worked only the first trip. Photograph courtesy Robert Riley. 24047 with a short freight towards the end of its career. On August 26th 24047 was noted at Curzon Street. On September 3rd 24047 was at Bescot depot, heading out the next day (3rd) with a freight to Stoke. September 25th (and/or 27th) saw the 19.30 Huddersfield - Wakefield Kirkgate parcels in the hands of 24047. 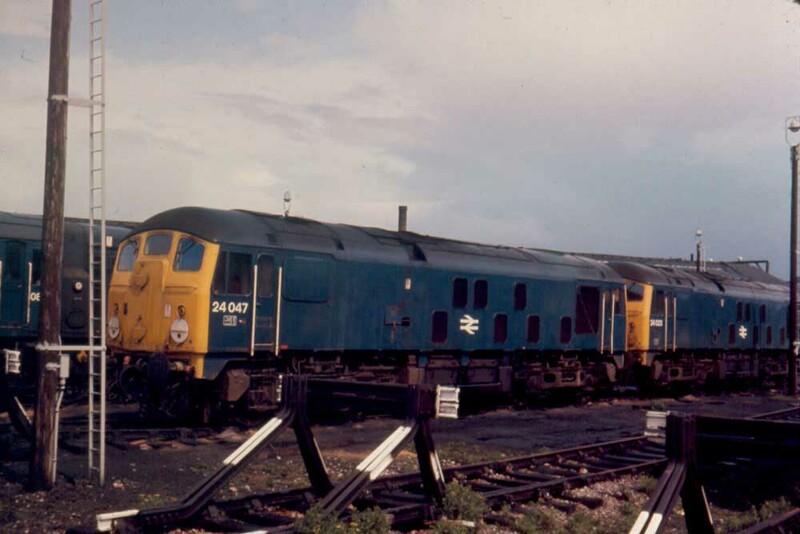 On September 25th pair of Class 24s, one of which was 24047 were noted at St Helens goods yard with empty sand wagons, presumably having brought in a loaded sand train from Oakamoor. Nineteen years of service came to an end for 24047 on November 11th when it burnt out its main generator at Mickle Trafford whilst working the 08.39 Shotwick – Stoke freight. It was assisted to Northwich by 40020, where it was left on shed. 40125 towed it away on November 15th in the 22.44 Northwich – Bescot freight, being taken out at Stoke and dragged alone to Crewe by 40125. By December 13th it was on its way to Doncaster Works accompanying 24035. Condition final: blue/yellow livery, gangway doors sheeted over, full size fuel & water tanks, blanking plates fitted, hand/footholds plated over, three-rung bogie mounted footsteps fitted, straight sided sandboxes. Page added August 7th 2014.